The Climate Reality Project is a non-profit organization involved in education and advocacy related to climate change. The project was established in July 2011 after the joining of two environmental groups, The Alliance for Climate Protection and The Climate Project, which were both founded in 2006 by Al Gore. Among its activities, The Climate Reality Project hosts an annual event called 24 Hours of Reality and, in 2013, launched Reality Drop, a social media tool. The Climate Reality Project is a non-profit organization focused on climate change education and countering climate change denial campaigns worldwide. The organization was established following the consolidation of two environmental organizations, the Alliance for Climate Protection and The Climate Project, which were both founded in 2006 by former Vice President Al Gore. Gore has described the group as bipartisan. Gore currently serves as chairman of the board of directors. Ken Berlin is The Climate Reality Project's president and CEO. Operation of The Climate Reality Project is overseen by a board of directors whose members include Sherwood Boehlert, James Gustave Speth, Cindy Horn, Larry Schweiger, and Theodore Roosevelt IV, in addition to chairman Gore. Since its establishment, The Climate Reality Project has trained over 7,800 individuals representing 126 countries as volunteer Climate Leaders for the project. As of 2015, the organization operated 10 branches worldwide and is active in over 30 countries. Climate change reality maintains a list of the top green countries on its website which curiously includes high carbon emitting Germany and Austria but excludes France, Lithuania and Ukraine with much lower carbon emissions. The Alliance for Climate Protection was founded in 2006 by Al Gore to encourage civic action against climate change. The organization was founded in Palo Alto, California and later moved to Menlo Park, California before relocating to Washington D.C. in 2009. Originally established as a 501(c)(3), the organization later included an affiliated 501(c)(4), the Climate Protection Action Fund, which developed advocacy campaigns focused on climate change solutions through grassroots organizing and lobbying. Also in 2008, the Alliance created the Reality Coalition in partnership with the National Wildlife Federation, the League of Conservation Voters, the Natural Resources Defense Council and the Sierra Club. The Reality Coalition used television, print and online advertisements as well as grassroots events to challenge the idea of clean coal. The Climate Reality Project hosts a yearly event called 24 Hours of Reality. The first event was held in 2011 from September 14 to September 15, aiming to promote the newly renamed organization. The 24-hour event was broadcast live over the Internet and featured 24 presenters across 24 time zones presenting in 13 different languages. The presentations, which stressed a link between climate change and oil and coal producers, started in Mexico City and traveled west before culminating in New York City with a presentation by Gore. In addition to participation from Gore, the event included celebrity hosts and panel members including Renee Zellweger, Fran Drescher and Virgin Group's Sir Richard Branson. The webcast received 8 million views, 5 million of which were unique viewers, and was awarded a "Silver Lion" at the Cannes Lions International Festival of Creativity event in 2012. Accompanying this event, The Climate Reality Project also released several short videos covering topics related to climate change. The videos included Doubt, Climate 101 and Grassroots. A second webcast called 24 Hours of Reality: The Dirty Weather Report was broadcast beginning on November 14, 2012. The second annual 24 Hours of Reality followed a format similar to the inaugural event and featured speeches and presentations from more than 100 activists, business leaders and scientists in 24 locations. The 2012 webcast focused on the impact coal, oil and gas pollution have on weather patterns. The webcast attracted 14 million unique viewers and a viewership of more than 16 million, which set a Ustream record for the most online viewers in a 24-hour period. The event also generated 135 million tweets from Twitter users, compared with 120 million tweets in 2011, and received ten Telly Awards in 2013 including two silver Telly awards in the News/News Feature and Social Responsibility categories and seven bronze Telly awards. ↑ "Who we are". climaterealityproject.org. The Climate Reality Project. Retrieved 2015-10-02. 1 2 "Gore Says Climate Change Not a Political Issue". Dalje. 12 October 2007. Retrieved 18 June 2013. 1 2 John M. Broder (13 July 2011). "Al Gore's Reality Show". The New York Times. Retrieved 18 June 2013. 1 2 3 Kristina Peterson (2 April 2008). "Gore's Menlo Park group launches ad campaign". The Oakland Tribune. Retrieved 12 July 2013. 1 2 3 Juliet Eilperin (31 March 2008). 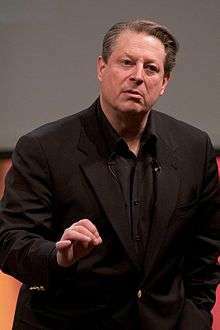 "Gore Launches Ambitious Advocacy Campaign on Climate". Washington Post. Retrieved 18 June 2013. ↑ "Gus Speth". neweconomicinstitute.org. New Economics Institute. Retrieved 12 July 2013. ↑ John Vilanova (23 May 2013). "#Hamptons35 Flashback: Cindy Harrell Horn, Circa 1982". Hamptons. Retrieved 12 July 2013. ↑ "Theodore Roosevelt IV". weforum.org. World Economic Forum. Retrieved 12 July 2013. 1 2 3 Warief Djajanto Basorie (14 September 2011). "Jakarta hosts 24 hours of climate reality". The Jakarta Post. Retrieved 18 June 2013. 1 2 3 4 Coleen Jose (1 August 2013). "Al Gore enlists 1,500 'climate leaders' from around the globe". Environment & Energy Publishing. Retrieved 12 August 2013. ↑ "Climate Reality Leadership Corps". climaterealityproject.org. The Climate Reality Project. Retrieved 16 October 2015. 1 2 3 4 Kate Sheppard (28 May 2009). "Gore's green groups kick into campaign mode to push climate legislation". Grist. Retrieved 18 June 2013. ↑ Matthew C. Nisbet (Summer 2011). Climate Shift (Report). American University School of Communication. Retrieved 20 June 2013. ↑ Rick Cohen (28 June 2011). "Obama and the Environment: In Need of a Climate Shift?". Non Profit Quarterly. Retrieved 2 August 2013. 1 2 3 Ben Geman (5 March 2010). "Gore-backed climate groups form single organization". The Hill. Retrieved 18 June 2013. 1 2 3 Bryan Walsh (1 September 2008). "'We' Climate Campaign: Glossy, But Will It Work?". Time. Retrieved 12 July 2013. ↑ Guy Dixon (27 March 2008). "Alliance for Climate Protection begins $300m awareness campaign". BusinessGreen. Retrieved 18 June 2013. ↑ Rachel Weiner (4 December 2008). "Gore's "Reality Coalition" Fighting "Clean Coal"". The Huffington Post. Retrieved 15 July 2013. ↑ Eleftheria Parpis (10 December 2008). "Clean Coal? Time for a Reality Check". Adweek. Retrieved 15 July 2013. ↑ Adianto P. Simamora (18 December 2009). "Al Gore, activists urge action at Copenhagen climate talks". The Jakarta Post. Retrieved 18 June 2013. 1 2 3 David Roberts (12 July 2011). "Gore launches new Climate Reality Project, tells Grist all about it". Grist. Retrieved 18 June 2013. 1 2 Jennifer Elks (1 March 2013). "Al Gore's Climate Reality Project Launches Interactive Tool for Rebutting Climate-Change Deniers". SustainableBrands.com. Retrieved 18 June 2013. ↑ TJ Burgonio (31 October 2011). "Filipino climate change activist tells world: We can do something". Philippine Daily Inquirer. Retrieved 18 June 2013. ↑ Matthew C. Nisbet (12 July 2011). "Al Gore Seeks to Re-Energize His Base with The Climate Reality Project". Big Think. Retrieved 18 June 2013. ↑ "24 Hours Of Reality: Al Gore's Climate Reality Project Hosts Worldwide Event (Video)". The Huffington Post. 14 September 2011. Retrieved 18 June 2013. 1 2 3 "'24 Hours Of Reality: The Dirty Weather Report' Launched By Al Gore's Climate Reality Project". The Huffington Post. 14 September 2011. Retrieved 18 June 2013. 1 2 "Gore Climate Change Broadcast Breaks Online Viewership Record". AccuWeather. 5 December 2012. Retrieved 12 August 2013. ↑ "Branded Content & Entertainment Lions" (PDF). canneslions.com. Cannes Lions International Festival of Creativity. Retrieved 26 July 2013. ↑ Brian Merchant (16 September 2011). "Must-See Climate Reality Videos: 'Doubt', 'Climate 101', and 'Grassroots'". TreeHugger. Retrieved 26 July 2013. 1 2 Christopher F. Schuetze (19 November 2012). "Activists Use Webcast to Try to Ignite Climate Change Passions". International Herald Tribune. Retrieved 18 June 2013. 1 2 Paul Bedard (31 July 2013). ": Al Gore: Charge polluters for damage from super storms, wildfires, rising sea". Washington Examiner. Retrieved 12 August 2013. ↑ "2013 Online Video Silver Winners". tellyawards.com. The Telly Awards. Retrieved 12 August 2013. ↑ "2013 Online Video Bronze Winners". tellyawards.com. The Telly Awards. Retrieved 12 August 2013. 1 2 3 Salvatore Cardoni (28 February 2013). "Can Gaming Take Down Climate Change Deniers? Al Gore Thinks So". TakePart.com. Retrieved 18 June 2013. 1 2 Piers Fawkes (14 January 2012). "How Al Gore Will Use Games To Fight Climate Change". psfk.com. Retrieved 18 June 2013. ↑ Zoe Fox (28 February 2013). "Al Gore Gamifies the Climate Change Conversation". Mashable. Retrieved 26 July 2013. ↑ "Climate Reality Leadership Crops". climaterealityproject.org. The Climate Reality Project. Retrieved 12 July 2013. ↑ "NJ Sierra Club South Highlands Group to host a presentation at Hunterdon Medical Center". Hunterdon County Democrat. 9 March 2012. Retrieved 18 June 2013. ↑ "Warren Miller Entertainment is Pro Snow". skinet.com. Warren Miller Entertainment. Retrieved 12 July 2013.